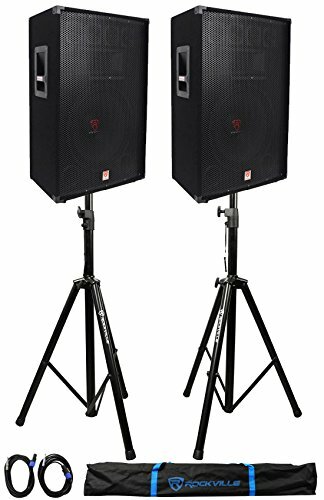 The Rockville RSG-15 speaker system features a high quality 15" low frequency woofer with three electronic, high-efficiency piezo bullet tweeters and one high efficiency piezo compression horn tweeter that provide a true full-range of sound. This speaker produces an incredible amount of power. 1500 Watts peak, 1000 Watts Program Power, and 750 Watts RMS Power. With 80 Oz magnets, you can be sure these speakers will produce the power you expect out of them. Construction: High-Density, High-Quality Non Resonant Particleboard, Stapled, Bonded & Braced. SpeakON Input connection, ¼" In/Out connections (Parallel). Dimensions: (20.5+13.2)x13.8x29.5in, Weight: 39.24Lbs. Pole Mountable, Rubber Isolating Feet, Construction: High-Density, High-Quality Non Resonant Particleboard, Stapled, Bonded & Braced.